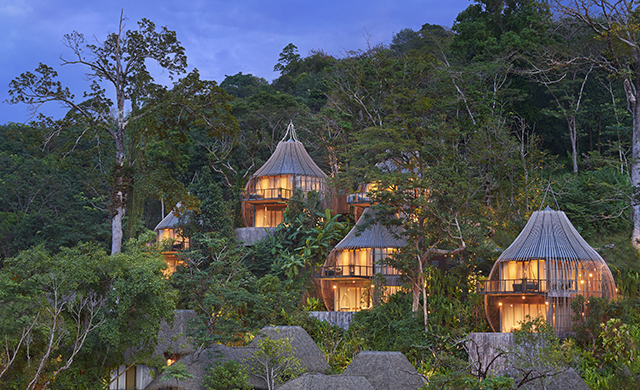 Redefining the essence of Thai hospitality, Keemala fuses tradition and sustainability with luxury and contemporary designs in one magical must-visit village resort. 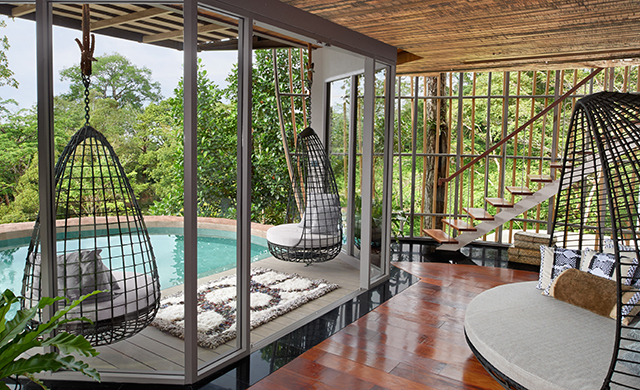 estled on the hillside forests of Kamala on the Thai island of Phuket, Keemala resort stands apart from its peers. The award-winning ultra-luxury resort — Best View, Best Interior Design, World's Sexiest Bedroom, Southeast Asia's Luxury Villa Resort, Sexiest Design ­­— offers an enchanting backstory as inspiration matched only by the beauty of its stunning architecture and interior designs. Couple that with a focus on a holistic, sustainable and natural lifestyle and guests are immediately transported into a chic and other-worldly village that epitomises exclusivity in the eco-conscious era. Conceptualised and owned by the prominent local Somnam family, Keemala was designed as a showcase for Thailand's finest, from the commission of renowned Thai architect Pisit Aongskultong to the creation of organic products through local farming. Keemala resort Phuket Where four tribes come together To fully realise the unique vision, Aongskultong and the Keemala team dreamt up four fictitious tribes that would truly represent the local heritage. From here they set about creating a hillside utopia which boasts four distinct palatial palaces; the clay pool cottage, the tree pool house, the tent pool villa and the bird's nest villa. 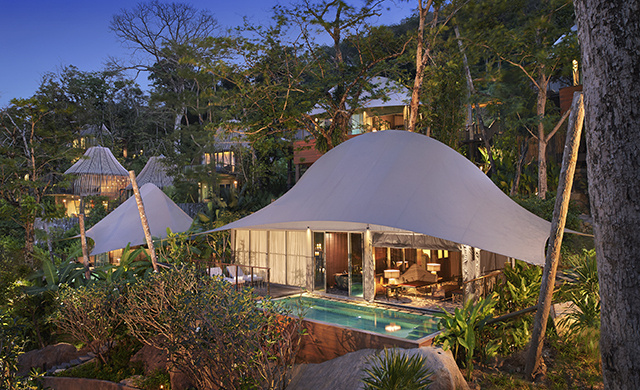 Keemala resort Phuket Tent villa The clay pool cottage reflects the Pa-Ta-Pea clan, a primarily agricultural tribe who lives off the treasures of the surrounding nature. From farmers to fishermen, the simple way of life is highlighted by abodes made from natural materials, including beds made from soil and clay. Meanwhile, the We-Ha clan, a group formed of healers and inventors, inspired the tree pool house, where the tribe's close affinity to the divinity is showcased through the 'hanging' structural and design elements, reflecting a closeness to the sky. The tent villas, with its canvas walls and interior elements — think safari chairs, barrel-looking sinks and closets in the shape of travel trunks — represent the nomadic lifestyle of the wanderers and travellers from the Khon-Jorn clan. 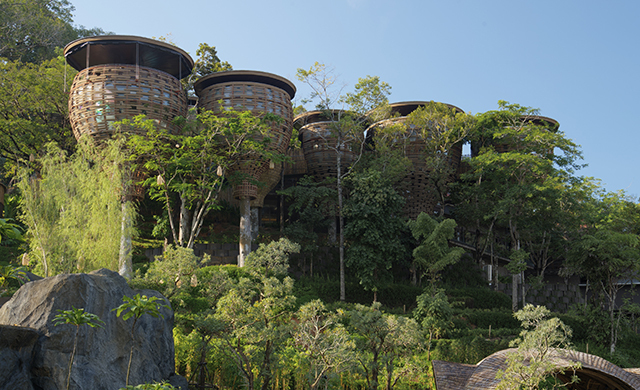 Finally, the Rung-Nok tribe inspired the bird's nest villas. Made up of creatives and philosophers, the clan believed in rejuvenation in addition to coveting their privacy and sense of well-being, leading to the interwoven design of the villas. Each one distinctly different, the villas also boast private pools, outdoor showers and standalone bathtubs, with almost every single palatial unit offerings a view of the lush vegetation that stretches to the open sea. 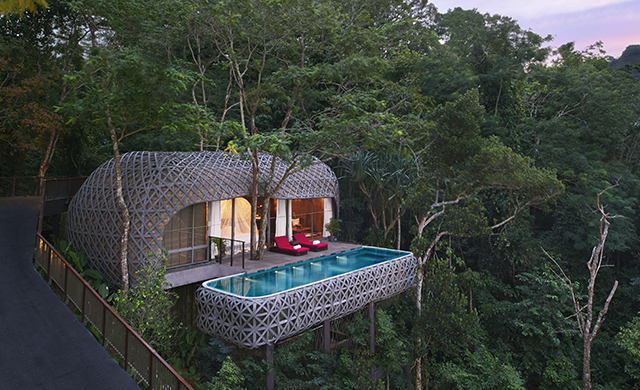 Keemala resort Phuket Treehouse villa In line with Keemala's ethos of being one with nature, the landscape that surrounds the villas are intentionally left to its natural state. In fact, the desire to keep nature as untouched as is humanly possible is reflected in many design quirks, the best example of which is exemplified in a private pool that's designed around a large tree instead of simply cutting it down. Speaking of designs to suit nature, it's worth noting that each villa, even under the same category, is unique and while the core blueprints are followed, the goal to integrate with nature ensures that each one has its own exclusive elements, be it in the placement of terrace or the orientation of a pool deck. 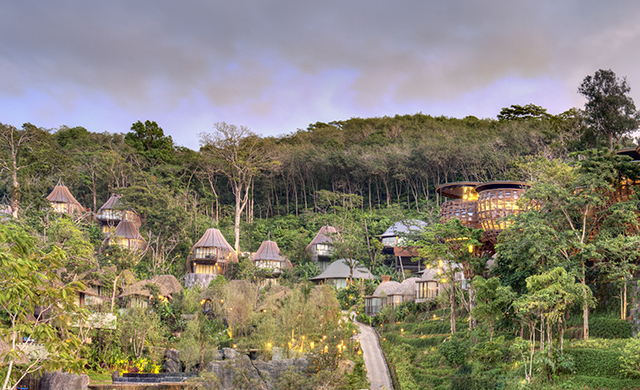 While the villas are the centrepieces of the resort, Keemala also provides an enchanting time in and around the resort with its carefully curated landscape. The private entrance atop a hill — the highest resort in the district — offers a glimpse into an exclusive and unique sanctuary as the peak of the tents, cottages and tree houses peek out of the vegetation. A quick buggy ride to the welcome reception sees you drive past a vegetable and fruit garden complete with papayas and mangoes while in the distance, the uber lush pool, where a host of complimentary activities like aquatic yoga are offered, invite you to cool off from heat of the tropical sun. Keemala resort Phuket Natural treasures Throughout the resort, symbols of each tribe are incorporated to emphasise the local traditions and remind guests of the Keemala story, from the bright mosaic floors of the lobby area to the cushion covers at the restaurant, as well as the etched winding walkways. 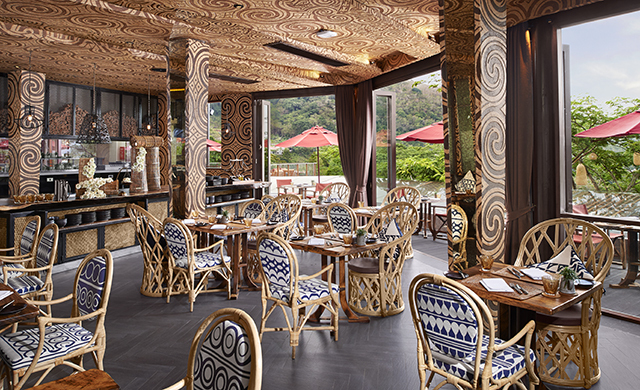 The Mala restaurant, the main dining venue, is the communal heart of the resort. Here, Executive Chef Poonsak Srimuang and his team of culinary masters create fine gastronomy with a focus on Thai, Indian and Western cuisines. Catering to Muslim travellers, all meats are halal which further opens up a journey for the tastebuds that is both exciting and enticing. Ingredients are all sourced from the Keemala's own organic gardens — both conventional and hydroponic — from the vegetables and herbs to the poultry courtesy of the free range ducks and the responsibly farmed chickens. Keemala resort Phuket Mala restaurant Highlights of the comprehensive menu include the fried fish with papaya salad, burrata, the beef masamman curry as well as the vegetable satays. For those who prefer a local taste, the tom yam, available in both meat or vegetable options, offer a perfect blend of spices along with a spice note at the end. Also popular are the salt brick where fine grades of meat or seafood are cooked on bricks made from pure pink salt, infusing its natural salts into your meal. Choose from a vast array of meats including lamb rack, striploin, lobster as well as salmon and seabass. 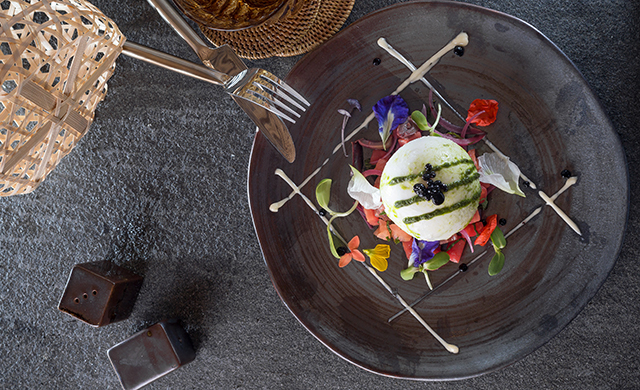 Keemala resort Phuket Must-try burrata After savouring the masterful culinary moments at Mala restaurant, indulge in a little at the holistic Mala Spa, voted Asia's Luxury Destination Spa. Charming hut-inspired treatment rooms await the discerning guests, each one equipped with its own private bath that overlooks the forest. Unwind through a host of exclusive treatments from facials to full-body massages. 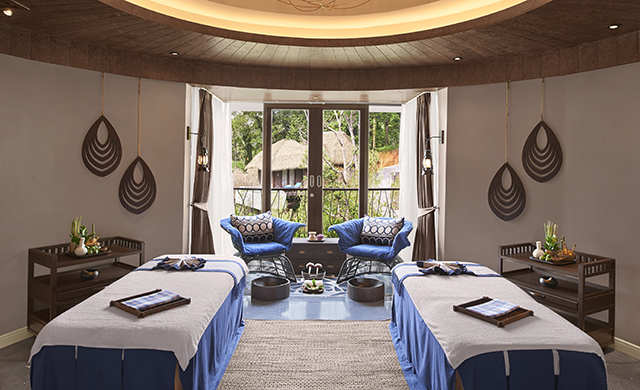 Recommended for the traveller is the Nuad Pan Boran, a traditional Thai massage that focuses on relieving tension at the muscles and joints to achieve an energised state of mind and body. The age-old techniques here ensure deep tissue healing as well. Continue the pampering with the Rejuvanating Facial where deep cleansing, exfoliating and nourishing are the main themes. For those who are more organic or naturally-inclined, rest assure that Mala Spa utilises the finest natural and locally-made products — VOYA, Siam Botanicals and SpaRitual — that are both free of parabens and animal testings. If you're looking for a exclusively pampering experience, Keemala offers several packages that include a wide range of treatments specially curated for you throughout a three to seven-day period. With its combination of unique accommodation options, an intriguing story, charming landscape, exclusive activities and sustainable goals, Keemala is the perfect island destination to fully appreciate the local culture and traditions of Phuket. For more information as well as reservations, visit keemala.com or call +66 76 358 777.